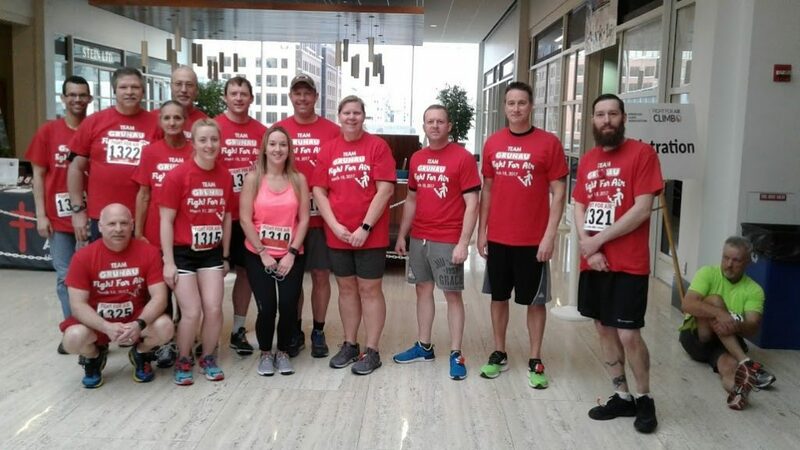 Healthy Living Sponsors Fight for Air Climb Team | Grunau Company, Inc.
On March 18, 2017, thirteen Grunau employees once again joined the Fight for Air Climb to help raise awareness of healthy lungs and healthy air. This annual climb was held at the US Bank tower in Milwaukee, the tallest building in Wisconsin. Participants climbed 47 floors and 1,034 steps to get to the top. Grunau’s Healthy Living initiatives encourage employees to take care of their bodies. Part of being healthy is getting involved in events like this climb and other community walks and runs. This year, Grunau’s team raised $1289 in funds for the American Lung Association, reaching beyond their goal of $1000. Milwaukee is proud to be the country’s largest Fight for Air Climb. News sources state total number of participants and funds raised in 2017 were the largest of all participating cities. Want to be Healthy at a Great Place to Work? Join our team at Grunau where we not only get the job done right but also have fun and be healthy while doing so!